AV Defender Professional is the PUP that uses misleading techniques to prevent removal. Use Reimage to locate malicious components and get rid of them faster than with uninstall instructions. A full system scan blocks virus reappearance and prevents traffic to malicious domains. What is AV Defender Professional? How can AV Defender Professional infect my computer? How to remove AV Defender Professional virus? AV Defender Professional is a totally malicious application, which has been added to rogue anti-spyware category. It is closely related to System Defender, Spyware Defender and other malwares. Remember that this program has nothing to do with computer’s security and the only thing that it seeks is the money. It’s a virus that reports about hundreds of different viruses and then offers to remove them from the system with the help of its licensed version. Of course, this licensed version is a useless thing that is used just for swindling people’s money. If you don’t want to be scared into thinking that your computer is seriously infected and that you need to buy AV Defender Professional malware, you should stay away from it as far as you can. Beware that it can try to infect your computer with the help of various tricky techniques. Such threats are typically hidden in illegal websites, misleading pop-up notifications and spam. In order to protect yourself from AV Defender Professional, we highly recommend you to install a reputable anti-spyware. In this particular case, we recommend you to use Reimage, which is a trustworthy removal tool. If this rogue infiltrates the system, it drops its files and then starts some of its process in computer’s background. In addition, this threat starts showing misleading system “scanners” that are set to report about different viruses. In most of the cases, these are either legitimate or nonexistent files, so we don’t recommend trying to remove them. Otherwise, you can get rid of useful applications that you use for browsing the web or protecting your computer. If you think that this malware is hiding in your PC system, you should waste no time and scan it with updated anti-spyware. We highly recommend avoiding manual removal of AV Defender Professional because you can leave malicious files that are related to this malware. If they are left on the system, they can be used for downloading another virus to your computer. This app is unable to delete all found threats! A suitable antivirus software is not installed on your computer. Please press Search Antivirus button to find and install suitable software to clean your system from threats. You need to immediately install antivirus software and clean up your computer. Your personal data is at risk! If you have just started seeing such alerts, it means that you have been tricked by fake alert telling you that you need to check your computer for free. In addition, such fake notifications can inform you that your computer is seriously infected and that you need to install a free malware remover. Of course, nothing is for free these days and such offers are totally misleading. Besides, you can be tricked into downloading AV Defender Professional virus to your computer after downloading a malicious email attachment, so please stay away from suspicious mails and always double check them in order to make sure that they are not trying to infect your computer. The easiest way to avoid such threats is to install a reputable anti-spyware. 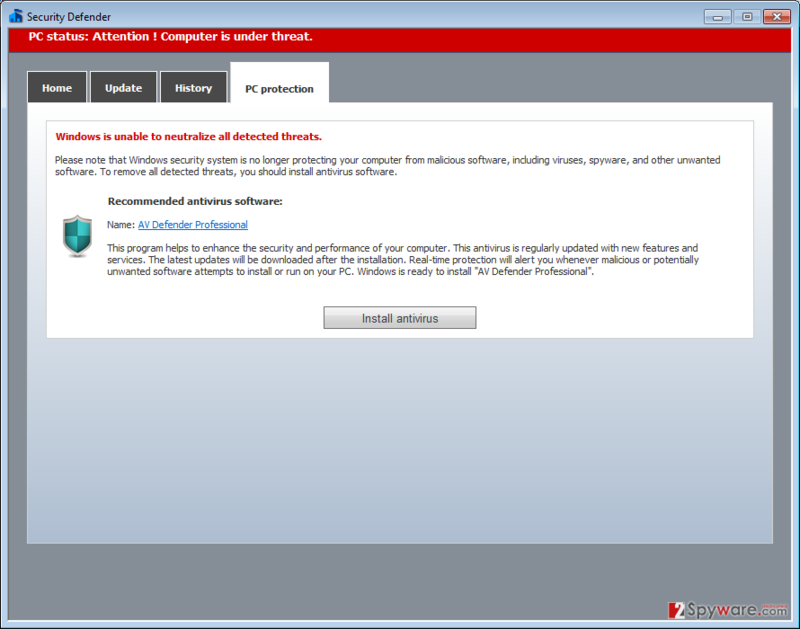 If fake System Defender or AV Defender Professional alerts are bothering you, it means that your PC is infected. In this case, you should download a reputable anti-spyware program and update it to its latest version. Now it’s time to run a full system scan (here is a detailed guide explaining how to do that: guide). For the removal of AV Defender Professional malware, we highly recommend Reimage or Malwarebytes MalwarebytesCombo Cleaner, because they can easily detect every hidden component that belongs to this and other cyber threats. Go to the Windows 8 Start Screen and type restore point in the Search section. Now click on Settings -> Create a restore point. When in System Protection tab, select System Restore. Click Next button to see your restore points and left click on the entry you need. Now select Scan for affected programs -> Close -> Next -> Finish. Once your PC reboots, download Reimage and run a full system scan after updating it. Click on Windows key and go to the bottom-right corner. Select Settings -> Change PC Settings -> General. Click theRestart Now buttonunder Advanced Startup. Now selectTroubleshoot -> Advanced Options -> Startup Settings. Now choose Restart and press F5. Download a program on your desktop and launch it to remove malicious files. Take another computer that is not infected by this virus and download Reimage. After completing the procedure, transfer this anti-malware to the CD/DVD, external drive, or USB flash drive. In the meanwhile, kill malicious processes on your infected computer. For that you can use this tutorial. Stick the device you used for transferring anti-spyware program to your infected PC and launch it. This entry was posted on 2015-09-01 at 06:11 and is filed under Rogue Anti-Spyware, Viruses. You can quickly scan the QR code with your mobile device and have AV Defender Professional manual removal instructions right in your pocket. How did you remove AV Defender Professional?